Configured to carry eight passengers the length of the cabin is 23.5 feet long, 5.9 feet high and maintains a width of approximately 6.1 feet. These measurements contribute to a total volume of 700 cubic feet, giving passengers ample room to move about and stretch out comfortably. The baggage compartment measures 115 cubic feet, allowing plenty of space for several bags of different proportions. The aft lavatory’s enclosed design allows for complete privacy inflight. Armed with three Honeywell TFE731-31C engines which enables the aircraft to accomplish a range of 3,123 nautical miles, approximately seven hours of flight time. The wing design also enables the jet to reduce drag even at high speeds. With these features, the noise while inflight is reduced dramatically. In completing the Falcon 50 Dassault produced a high performing plane that is not only swift, but also provides passengers with a roomy cabin, long intercontinental ranges and reduced noise while inflight. With all these features, the Falcon 50 is able to maintain low fuel consumption, which directly effects low operating costs. 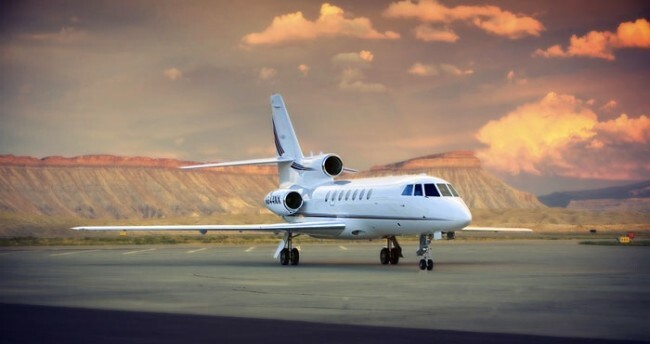 For more information on chartering a Falcon 50, price out your flight here for an instant quote.